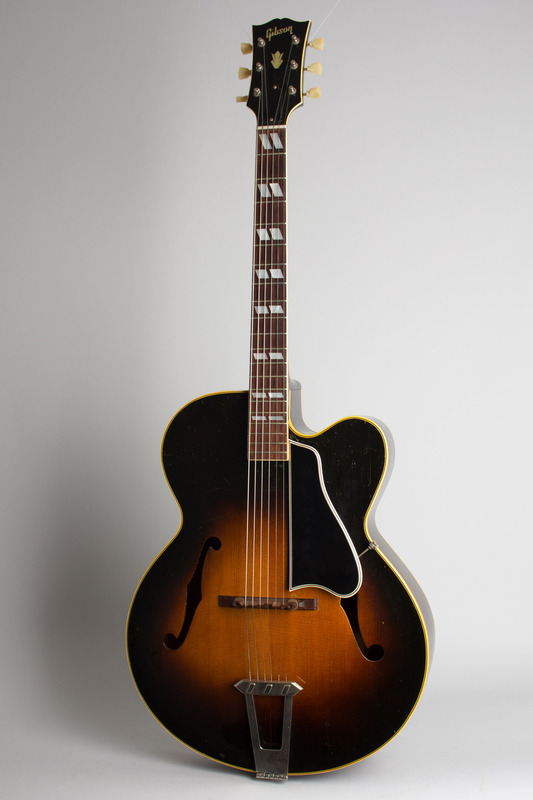 Gibson L-7C Model Arch Top Acoustic Guitar (1953), made in Kalamazoo, Michigan, serial # 15033, sunburst top, dark back and sides finish, maple back and sides, spruce top; maple neck with rosewood fingerboard, original brown hard shell case. This nicely preserved mid-1950s L-7C is a lovely example of a purely acoustic 17" cutaway arch-top guitar, which in 1953 was fast becoming a fading breed at Gibson. It has never been altered as many have for electrification, and remains original except for an added strap button on the heel. 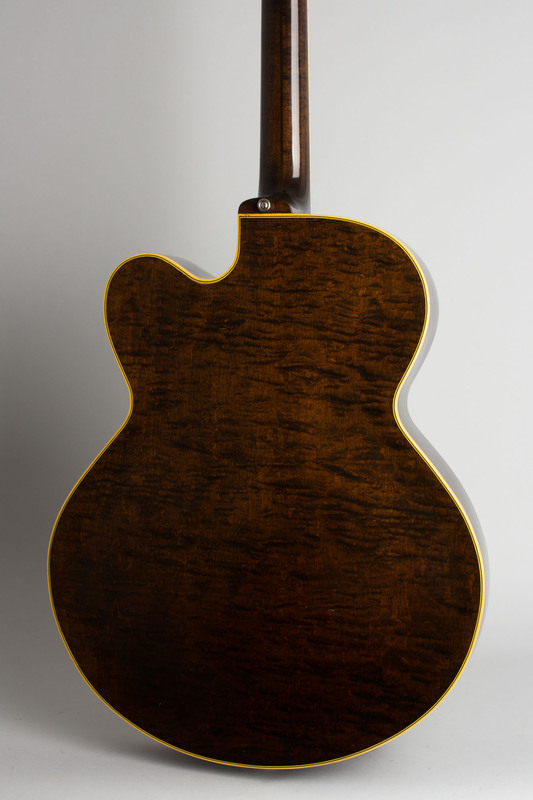 The guitar shows features typical for the period. The top is finely carved spruce and the rim and back are solid maple, with a nice figure on the back. The neck and headstock are single bound, with triple binding on the body. 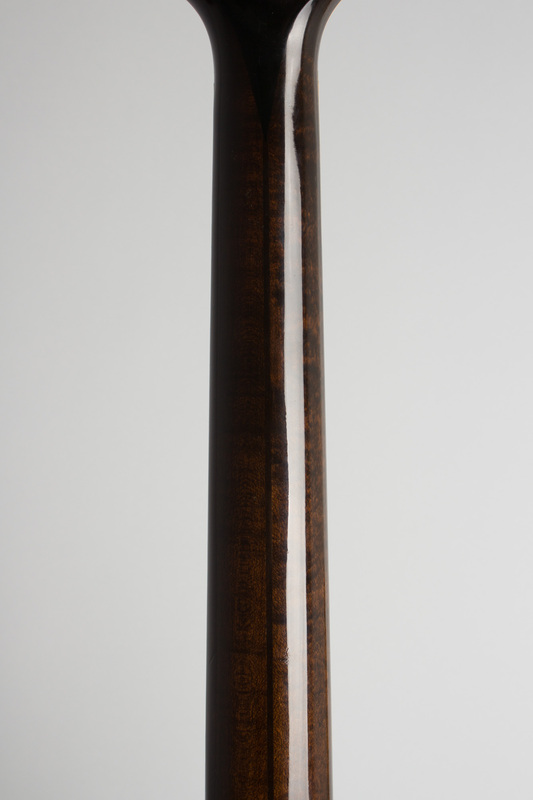 The neck is maple with a center laminate ebony strip and rosewood fingerboard. 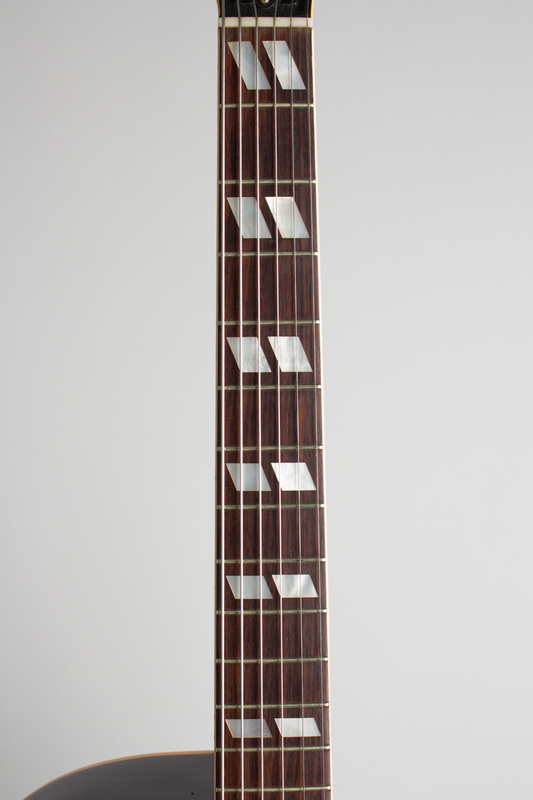 The pearl fingerboard inlay is a double parallelogram pattern with Gibson's traditional pearl crown on the headstock. 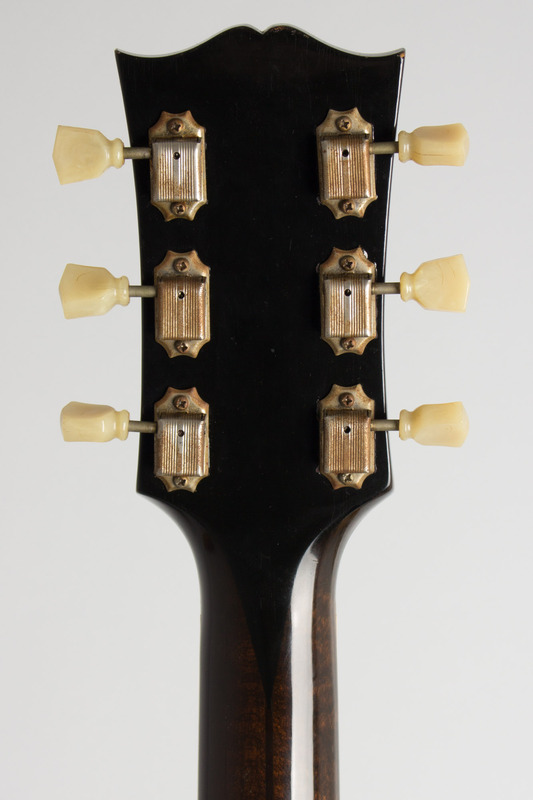 The solid-base adjustable rosewood bridge, hinged nickel-plated tailpiece and individual Kluson Deluxe tuning pegs with tulip buttons are standard early 1950's fittings. 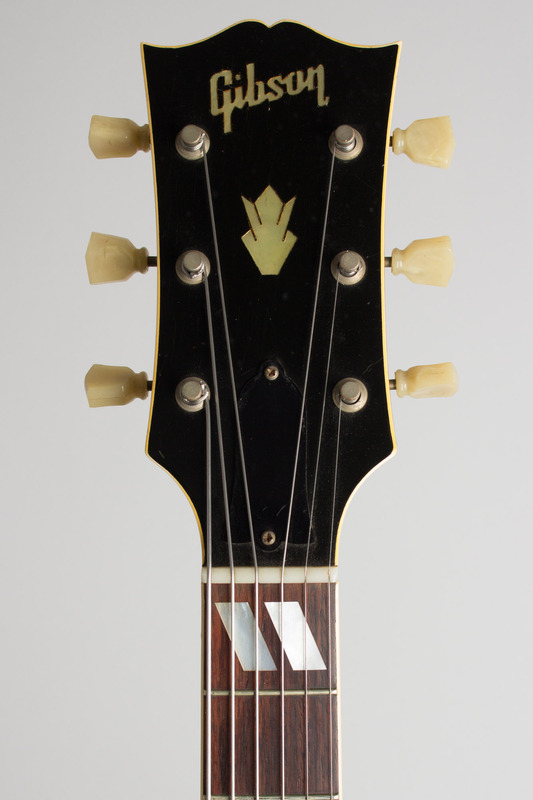 The white Gibson "artist" label inside the body indicates a shipping date in late August 1953, one of 172 L-7C's shipped that year-actually the peak of production for the model. At the time Gibson's output was rapidly becoming more dominated by electric instruments as the acoustic archtops the company had originally pioneered lost favor with "modern" players. Today they are once again appreciated for what they are, fine sounding guitars applicable to a range of styles. 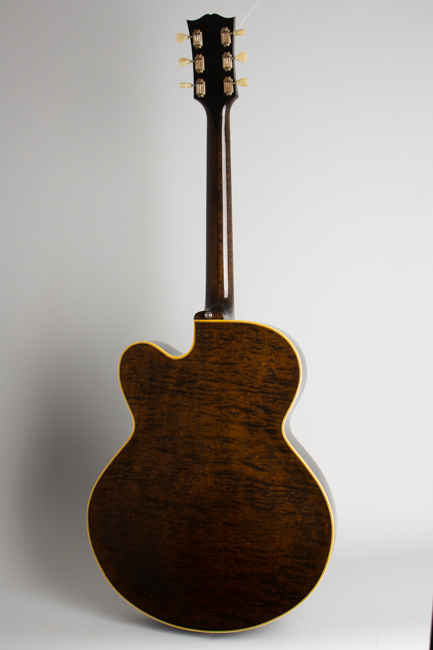 The L-7 was nowhere near the top of the line but is still a great all solid wood arch-top perfectly at home in its original unplugged mode. This model is well on par with many of the more expensive carved-top Gibsons, a fully professional instrument then and now. It can also be easily adapted to amplified use with a DeArmond or similar pickup with great results. Overall length is 42 1/2 in. (108 cm. ), 17 in. (43.2 cm.) wide at lower bout, and 3 1/4 in. (8.3 cm.) in depth, measured at side of rim. Scale length is 25 1/2 in. (648 mm.). Width of nut is 1 11/16 in. (43 mm.). 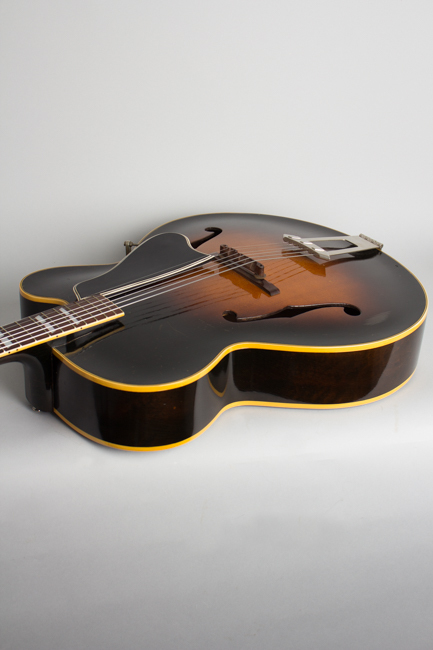 This is a super nice all original example, with some light wear but no alterations. The finish shows some dings, dents and scrapes but overall is well preserved with no large areas of loss. 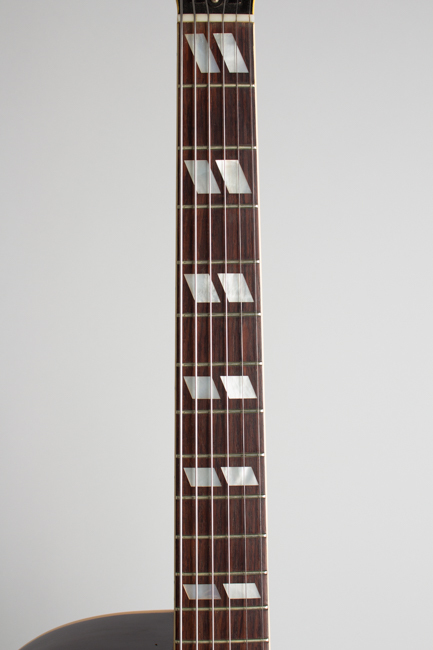 The original thin frets have very little wear and this is a great-playing guitar with a lovely full sound. 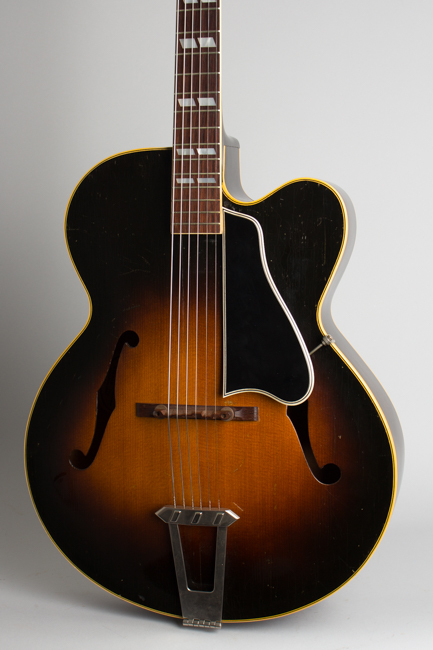 The original flannel-lined brown case is included, somewhat more worn-in than the instrument, still fully functional but with several decent sized spots of covering inexplicably removed on the top side. Excellent Condition.